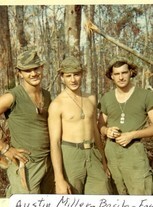 (DEROS 7 NOV 1968) 8 NOV 1967 - 4 NOV 1968 / BASIC TRAINING : FT. DIX, N.J. / A.I.T : FT. POLK LA. Jim Basile posted a message. New comment added. Jim Basile posted a message. Happy Birthday, Bill ! Enjoy your Day! Cliff, Wishing you a Happy Birthday, Have a Great Day! Jim Basile has a birthday today. Jim Basile added a comment on his Profile. To Doug(Cpt.Foster) ; Happy Birthday with memories of Brotherhood ! Jim Basile added a comment on Douglas Foster's Profile. 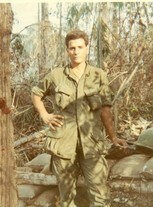 ON THIS VETERANS DAY ,I REFLECT BACK TO MY TOUR IN VIETNAM FROM NOV '67 TO NOV'68 ,AS AN INDIVIDUAL REPLACEMENT,UNLIKE OTHER CONFLICTS/WARS, WHERE UNITS WOULD BE THE REPLACEMENTS. AFTER A FEW DAYS OF SETTLING IN WITH MY UNIT,2nd PLATOON,DELTA CO. 3rd BN/12th INF-4TH INF DIV. THAT I BECAME PART OF A TEAM, DOING OUR JOBS AS SOLDIERS & BONDING WITH FELLOW SOLDIERS FOR A LIFETIME. YES WE LEFT SOME BEHIND AS MOST OF US COMPLETED OUR TOUR & RETURNED HOME. AND WE CELEBRATE THOSE LIVES BY LIVING OURS THE BEST THAT WE KNOW HOW. TIME PASSES BY QUICKLY, BUT THOSE TIMES ARE TIMELESS. BEST WISHES TO ALL ! Jim Basile updated his profile. View. Jim Basile added a photo to his profile gallery.